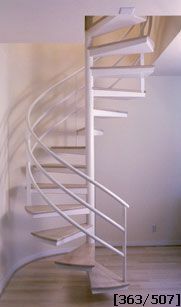 This stair has a 3-line rail system, 52" diameter, 27 degree treads with a mounting plate at the finish floor at top. The treads are # 122 (3/16" thick pan type steel) with a oak wood overlay with a nose # 140 (1" thick). The rail system uses three # 200 (1 1/2" rd steel tubes) spacing equally with a 1/2" x 2" steel baluster post at every quarter turn. The center column is a heavy duty 4" OD schedule 40 round steel pipe with a welded base plate. The finish is a white primer and the final paint and wood stain was applied on the job site by others.